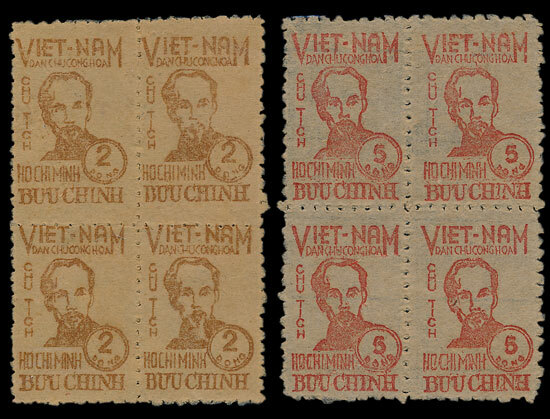 Lot 621 in our upcoming stamp auction features one of Vietnam’s most culturally important postage stamps – the 1946 Ho Chi Minh portrait design. 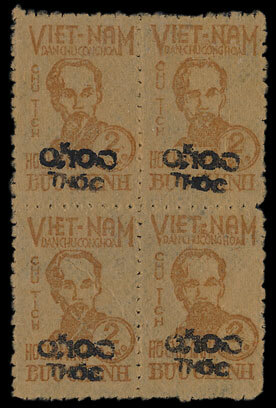 The significance of this design is in its innovation, being the first original stamp design produced by the Viet-Minh. The miniature full face renditions of the Vietnamese leader were printed on thin hand-made ‘gio’ paper and while the material itself was delicate the strength of the design could not be questioned. Nguyễn Sáng (1923-1988) was the Vietnamese artist behind the stamps. Sáng throughout his life contributed greatly toward the contemporary art scene in Vietnam. After graduating from École des Beaux-Arts d’Indochine in 1938 he was one of the first painters to join the Vietnamese revolution in 1945. Sáng was involved when the government seized power in Hanoi and visited the Viet Bac conflict zone to produce war paintings. His work “Unity”, created in the aftermath of the government seizing power, managed to capture the atmosphere of the historic moment and promoted patriotism amongst the Vietnamese people. Following the 1945 August revolution – a revolution orchestrated by Ho Chi Minh to overthrow French colonial rule in Vietnam – Sáng became heavily involved in the French resistance. He donated his artistic talent to agitation and propaganda and despite being taught by western teachers his art was directed toward the Vietnamese people. Between 1950 and 1952 he worked for the propaganda committee of the General Political Department and throughout the nine years of the resistance his art echoed the sentiment of the country. Sáng would often refer to the country's destiny, its soldiers, its civilians and its intellectuals. He was a man of the people producing art for the people. 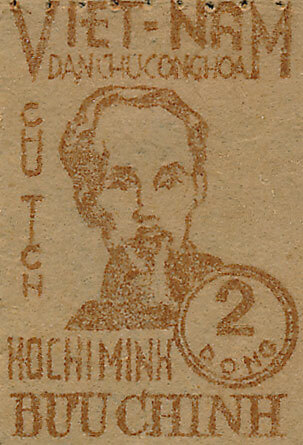 In 1946 Sáng was given the opportunity and honour of producing the first postage stamp of independent Vietnam (as seen above). This was the first time a stamp of their country had carried the word ‘Vietnam’ alongside an image of the founder of the Democratic Republic of Vietnam – marking a milestone in their postal and political history. Sáng who was famed for his ability to highlight both the character and the physical characteristics of a person, powerfully portrayed the Vietnamese leader. Minimal lines allowed the design to transition smoothly onto a woodcut block ready for printing, whilst still managing to encapsulate the portrayal of a leader the Vietnamese warmly referred to as “Uncle”. The cultural significance of this stamp is not to be understated and Sáng’s quality in design will long be celebrated by the Vietnamese people – who posthumously awarded him the Ho Chi Minh Prize for Literature and Art in 1996. Sáng is now finally receiving international acclaim and at an auction in 2016 his work sold for $101,000 (US). If you yourself are interested in trying your luck at auction, his stamps are available as UM blocks of four, including three blocks of overprinted issues. Please take a look at Lot 621 in our December stamp auction to find out more. You can view the full catalogue on our website which also has details on how you can place bids. For further updates keep up to date with our Twitter and Facebook pages.